Who knew purchasing a decent top hat would be so difficult. Yes, I know, they are NOT in style. Yes, I know that magicians have worked hard over the last 50 years to break away from the top hat image of a magician. I know. And yet, in the world of Steampunk and Time Travel, a top hat becomes a very important fashion item. It kind of makes me laugh that after all this time I would be in the market for a top hat. One of my best friends in the whole world used to wear a big colorful Mad Hatter style top hat for years. It was part of his costuming that most identified him to his audiences. I'm not really looking for that kind of hat however. I do want to top hat, but not Mad Hatter style. Unfortunately I'm having difficulty finding exactly what I'm looking for exactly. I know I've seen some pretty cheap looking hats which I won't go near. I've also seen some terribly over priced hats as well. I imagine I'll be going through several before I find the one that works perfectly. I'm looking for a hat like the one above, but in better condition. Sadly, I've found that the larger size hats come with a large price tag! For years I avoided the Magician/TopHat connection mainly because it was dated and because it was associated with rabbits. But then the U.S. Federal Government got involved, specifically, the USDA, and they have made it extremely difficult for a magician to even use a rabbit today because of tons of RIDICULOUS REGULATIONS. I know some folks are still using rabbits, some with a liscense from the govt and some without. I don't have the time to cater to the whims of drunk with power regulators, so for me, no rabbits. But rabbits aside, the top hat has many wonderful benefits for magic beyond our furry friends. For example, the Misers Dream was once presented with the hat. Given the large size of the hat, it makes an ideal prop to produce things from. There are hat juggling moves that can be done with the hat. But in the end I think it best serves magic when a magician keeps the top hat in it's proper context, as a period piece. It is really not proper attire for the 21st Century. But again, framed within the right context, it can still work quite well. My friend who I mentioned above used a hat quite successfully because he was more of a parody of a magician rather than a serious magician. His hat then fit him perfectly, no pun intended. 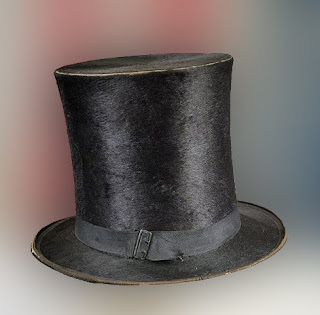 UPDATE: I have put an order in for a Victorian Style Wool Top Hat. It will serve the purpose initially. It's all part of the 'Steampunk Wizard' character that I'm developing. My frock coat also arrived today. I'm proud of myself because I used a very steam punk sensibility in the purchase of the coat. I found a used tux in a trench coat style and had it altered to become a 19th Century Frock. So I'm moving full steam punk ahead! 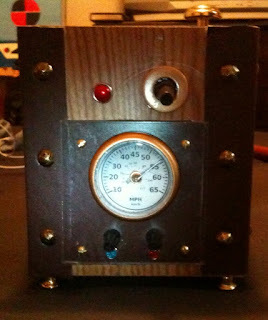 Another steampunked prop is almost ready. I say almost because I am still tweaking it. I'm looking for some parts that I can't yet find, so the prop itself may go into the show in a not quite finished condition. What is it you ask? I'm really looking forward to putting this into the show. It began as a very old piece of magic apparatus and has been transformed into a really fun routine. I hope I can get all the bells and whistles attached before I put it in the show, but if not, it still works as is! I'll provide a better image once it's totally finished!